as Enfold Server and Proxy). Before you can create a proxy definition in Enfold Proxy , you must have at least Zope client is running in Enfold Server or Zope/Plone. For information about how to start/restart Zope or Plone, check the documentation for Enfold Server or Plone. This last URL works only if you have already set up your Plone site. If you can access the URL via the management port (which in this case is 8080), that means that Plone or Enfold Server is running correctly. The next step to do is to create a proxy definition in Enfold Proxy. 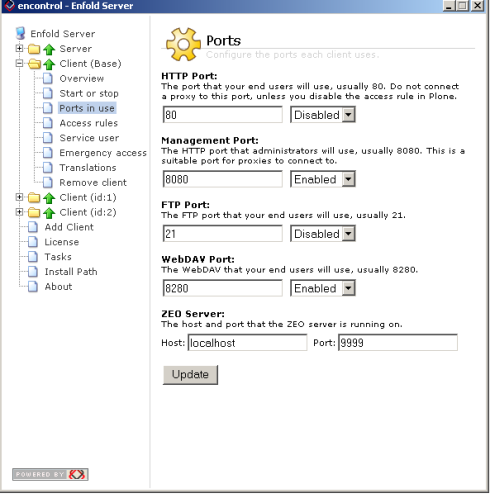 To avoid port conflicts when using Enfold Proxy, you need to make sure that the HTTP Port 80 is disabled for the Zope client in Enfold Server or Plone.